In this article I wanted to run you through installing Composer on a different base eclipse platform to the one Composer ships on. I’ve chosen eclipse Web Tools Project 1.5.5 as it is the latest release of the web tools to exist on a suitable eclipse stack (3.2). There are lots of compelling reasons to do this including providing a great start point for WDK-based development as well as for DFS development. DFS development is something I’ll focus on in up-coming future blog articles. Download and install the Web Tools Platform from here. This includes eclipse 3.2.2, emf 2.2.1 and gef 3.2.2 which are all minor release updates the ones that Composer uses. Unzip it to a folder. I’ll call this <eclipse 3.2.2 install dir> when I refer to it later. Composer also uses the EMF Validation Framework which isn’t included as part of WTP. 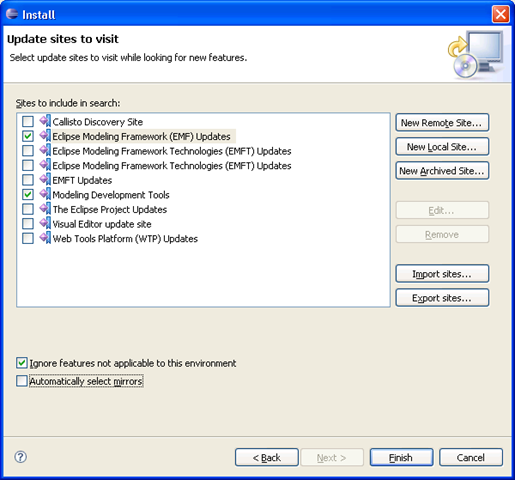 EMF Validation can be found on the EMF update site which should be listed as “Eclipse Modeling Framework (EMF) Updates” in your site list. Now EMF Validation requires the object constraint language (OCL). OCL can be found on the Model Development Tools (MDT) update site. You will probably need to add this site to your site list yourself. As part of this update process you will be required to resolve a couple of plugin dependencies. I’ll talk you through this as well. So, to begin navigate to Help->Software Updates->Find and Install->Search for new features to install. Add the MDT site, if required. Check both EMF and MDT (as shown below) and click Next. Select your mirrors and wait for the update manager to interrogate the sites. Uncheck the “Show the latest version of a feature only” checkbox. You should see a list of features similar to that below. To resolve this dependency, expand EMF SDK 2.2.3 and check “Eclipse Modeling Framework (EMF) Examples 2.2.0.v200705141058”. This should then satisfy the update manager which will enable the Next button. Click Next. Accept the terms and conditions. Click Next. Click Finish. The Update Manager will now download the selected features. Once downloaded. Choose Install All. After which you will be asked to restart eclipse. Do so. After it has restarted you can confirm the installation of these elements by navigating to Help->Software Updates->Manage Configuration and by inspecting the New Project wizard for J2EE and Web project artifacts. This completes updating your base web tools project platform with all the additional features that it needs to support Composer 6.0. Now we need to add the Composer features to complete the whole installation. Unfortunately, we haven’t got our own update site yet 😦 so this process is a manual one. Close eclipse again. 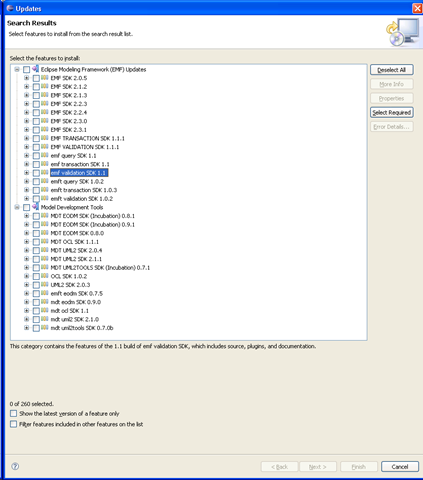 Navigate to <composer install dir>/features/ folder and copy all the com.emc.ide. * folders into <eclipse 3.2.2 install dir>/features/. Then navigate back to <composer install dir>/plugins/ folder and copy all the com.emc.ide. * jars and copy the two com.emc.ide. * folders into <eclipse 3.2.2 install dir>/plugins/. Make sure you do copy the folders otherwise Composer behaviour will be unspecified. That’s it. You’re now all set. 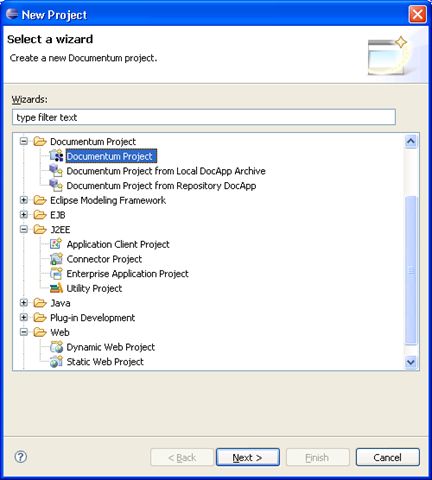 You can begin creating your web (WDK) and other web projects right alongside your Documentum artifact projects. Which means you can also manage them side-by-side in your version control systems as well. In this article I’ve shown you how to take the Composer features and install them on a different but compatible eclipse stack. TO those that are new to eclipse I hope this demonstrates some the flexibility of the platform itself and to all I hope it demonstrates some of vision for this product moving forwards. In up-coming articles I’ll run through Composer’s out-of-the-box DFS capabilities as well as showing you how to combine these with the web tools EAR and WAR project capabilities as well as its deployment and debugging capabilities. In the meantime have fun composing.